Don’t look now, but the pronoun “I” is becoming obsolete. Recent microbiological research has shown that thinking of plants and animals, including humans, as autonomous individuals is a serious over-simplification. A series of groundbreaking studies have revealed that what we have always thought of as individuals are actually “biomolecular networks” that consist of visible hosts plus millions of invisible microbes that have a significant effect on how the host develops, the diseases it catches, how it behaves and possibly even its social interactions. It’s a case of the whole being greater than the sum of its parts“It’s a case of the whole being greater than the sum of its parts,” said Seth Bordenstein, associate professor of biological sciences at Vanderbilt University, who has contributed to the body of scientific knowledge that is pointing to the conclusion that symbiotic microbes play a fundamental role in virtually all aspects of plant and animal biology, including the origin of new species. Microbiologists have coined new terms for these collective entities – holobiont – and for their genomes – hologenome. “These terms are needed to define the assemblage of organisms that makes up the so-called individual,” said Bordenstein. In the article Host Biology in Light of the Microbiome: Ten Principles of Holobionts and Hologenomes published online Aug. 18 in the open access journal PLOS Biology, Bordenstein and his colleague Kevin Theis from the University of Michigan take the general concepts involved in this new paradigm and break them down into underlying principles that apply to the entire field of biology. “One of the basic expectations from this conceptual framework is that animal and plant experiments that do not account for what is happening at the microbiological level will be incomplete and, in some cases, will be misleading as well,” said Bordenstein. November 20, 2018 - Should Evolution Treat Our Microbes as Part of Us? Quanta MagazineHow does evolution select the fittest “individuals” when they are ecosystems made up of hosts and their microbiomes? Biologist debate the need to revise. 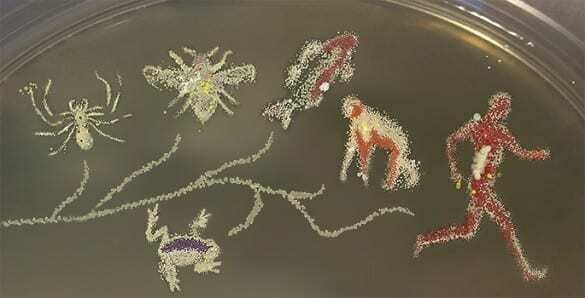 March 1, 2019 - Opinion: Individuals Are Greater Than the Sum of Their Parts The ScientistThe study of evolution requires consideration of organisms' microbiomes. July 9, 2018 - It's time to take a more holistic view of coral reef health Popular ScienceA new paper from a coral expert suggests that researchers need to pay more attention to what keeps corals healthy—not just what makes them sick.